Throughout the 1800s, Augusta-Richmond County’s location on the Savannah River made it a prime spot for industrial development and a jumping off point for moving goods throughout this region of the state. Now economic development is coming along a different route – fiber optic cables that connect a wide array of companies and government agencies to the Internet. While still a center for manufacturing, this city is seeing a high-tech future. The announcement a few years ago that the U.S. Army was moving its Cyber Center of Excellence to Fort Gordon was the tipping point. With a massive National Security Agency (NSA) facility nearby, the region has been transformed into an incubator for technology companies and education. Now their numbers are growing as the region becomes ground zero for the nation’s defense against cyberattacks on critical infrastructure. That’s also created an opportunity for the county to bolster its economy. “I want Augusta to be the No. 1 place in the state to do business,” says Mayor Hardie Davis. City officials and economic developers are working closely to make Augusta a welcoming place for businesses of all kinds and sizes – many of them focused on technology. In fact, the chamber just launched a new cyber and technology committee comprised of many of the tech companies located here, ranging from app builders to technology ventures firm and data-center developer Cape Augusta. “By bringing these companies together, they can make sure that as a community and as a chamber of commerce that we are addressing the issues that are most important for new and existing companies in this industry,” says Parr. Driving into Augusta along Riverwatch Parkway, one of the first things you see rising up along the Augusta Canal is a towering brick chimney. Today, it is all that remains of the Confederate Powder Works. This gunpowder factory was hastily constructed at the start of the Civil War to manufacture munitions for Confederate forces. Next to the cylinder is a sprawling, long-vacant brick building – Sibley Mill – that once housed a textile mill. The two structures speak to the area’s history, but these days they also represent Augusta and Richmond County’s future as a high-tech center. The historic Sibley Mill property is owned by the Augusta Canal Authority, which purchased it in 2010 with the goals of preserving the structures and finding a developer who could give them a new and more productive use. That developer – Cape Augusta – has been found. The firm will redevelop the property as a data center and campus for tech firms called Augusta Cyber Works. The authority will also continue to operate the hydropower plant inside the mill to provide the data center with electricity and water for cooling its servers. The hydroelectric generators in Sibley and next-door neighbor Kings Mill, also owned by the authority, can generate up to 4 MW of power, which, along with a direct connection to Georgia Power’s grid, ensures that a server farm can be kept up and running around the clock. Augusta is poised to capitalize on the emerging trend of locating large data centers in cities other than major markets such as Chicago, New York and Silicon Valley, says James Ainslie, CEO of Cape Augusta. Where an industrial plant might use 1 MW of power, large data centers can consume up to 80 or more megawatts of power. Having a reliable connection to the power grid is essential. The canal authority also hopes to bring similar development to King’s Mill in the future. That additional space could be very attractive to other tech companies or even serve as expansion space for Augusta Cyber Works. Training and education are vital for ensuring that the city’s burgeoning tech sector can continue to flourish. The focus on cybersecurity generated by the Army’s Cyber Command and NSA facilities prompted Augusta University to launch its own Cyber Institute. The university has been designated a National Center of Academic Excellence in Cyber Defense Education by the National Security Agency and the Department of Homeland Security. This designation is a part of the federal government’s effort to get more people interested in cybersecurity careers. “We just don’t have enough people with the skills and experience to help protect our nation,” says Joanne Sexton, Cyber Institute director. After hosting the region’s first Cyber Security for Defense Conference, the university began developing its own program. When it comes to economic expansion, Augusta has been on a roll. Since 2009, new and expanded businesses have totaled more than $1.5 billion. In 2014 and 2015 those investments were $331.6 million. 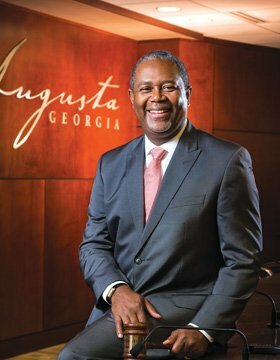 That pace has continued into the new year, with the first half of 2016 bringing $100 million in private company capital investments, according to Walter Sprouse, executive director of the Augusta Economic Development Authority. “And close to 2,000 new jobs during 2016,” he adds. The region has also been attracting good old-fashioned manufacturing firms that make tangible products. Earlier this year, company and city officials celebrated the opening of the $172-million Huntsman Corp. plant near Augusta Regional Airport. The facility will make the iron oxide color pigments – 30,000 metric tons annually – used to color concrete, plastics, food and paper. The facility, the first new pigment manufacturing plant in the country in 35 years, brought with it 300 construction jobs and will employ more than 140 permanent workers with a $5-million annual payroll. Augusta leaders have been celebrating a lot of company expansions and new arrivals – and the jobs they bring. Just last year, Solvay Specialty Polymers announced that it was building a new specialty polymers resin unit to boost its production capacity of polyether etherketone, or PEEK. In addition, carbon nano-tube-enriched concrete products maker EdenCrete Industries Inc. opened a $67-million global manufacturing headquarters and created more than 250 jobs. And, tech company Unisys garnered headlines when it moved into the former Fort Discovery museum space along Riverwalk Augusta. The museum closed in 2010, and the space had been vacant ever since. The new location is one of three Unisys service centers in the United States and will initially provide IT support for Army personnel needing end-user support services. The number of workers is expected to expand to about 700 over the next few years. Much of Augusta’s success in attracting these companies is a result of being in the right place at the right time. Its river location made it a prime spot for industry and commerce, and that also helped make the region an important player in the nuclear power industry as well. Augusta has other important assets as well, including its vibrant downtown. The historic stretch of blocks along the Savannah River has gotten quite a bit of attention in recent years, and those invest- ments are paying off. Along Broad Street and other thoroughfares that crisscross the city center, old buildings are being transformed into shops, restaurants and offices. The trend back to urban living has also spurred the renovation of historic buildings into loft apartments and condos. “Most have been built in the last few years,” says Margaret Woodard, executive director of the Downtown Development Authority of Augusta. While some have been around for as long as 15 years, many of the historic conversions on Broad Street, the main downtown commercial district, have happened more recently, she adds. Local developer Mark Donahue recently converted the former Lowrey Wagon Works, which had been abandoned and boarded-up for years, into 19 loft and one-bedroom apartments. Lowrey’s historic warehouse on Ellis St. was built just before the Civil War. During the war it was a Confederate shoe factory, and in 1865 a group of local churches housed Augusta’s first African-American school in the building. Its owner, Jacob Lowrey, took back the building the following year and restored the wagon operations. In more recent times, the structure has been a warehouse and a bicycle shop. Plus there’s the educational opportunities and high-quality healthcare. Aside from Augusta University and its 8,300 students, there’s also Augusta Technical College, which has become a leader in job training and education, and the private, historically black liberal arts Paine College. The county is also home to 11 hospitals and the nation’s largest burn center, the Joseph M. Still Burn Center at Doctors’ Hospital. Augusta University is home to the state’s premier medical school, and University Health Care System includes a 581-bed medical center that serves the entire region. The system has also added the $30-million University Hospital McDuffie and six new urgent care and practice locations, with more slated to open this year. It’s hard to talk about the Augusta economy without mentioning the Masters Golf Tournament. Held the first full week in April at Augusta National Golf Club, it regularly fills hotel rooms and homes and generates a large, if undocumented, amount of economic activity in the region. Of course, it’s not the only attraction that brings outsiders to town. Tourists spend about $1.2 million per day in the county on hotel stays, eating out and shopping. That number doesn’t include activity generated by the Masters. The tournament doesn’t release figures on ticket sales and attendance, and much of the spending by attendees tends to fly under the radar. That strength is reflected in every aspect of Augusta’s local economy and promises a bright future for the city, county and the region that surrounds it. Feel the Beat: When you talk to local leaders in Augusta about what draws businesses here, quality of life is tops. And a big part of that is the rich and varied music community. On any weekend you can listen to performers ranging from contemporary acts who fill the James Brown Arena to the world-class Symphony Orchestra Augusta to talented local country, jazz and hip-hop artists. “We have something for everyone,” says Brenda Durant, executive director of the Greater Augusta Arts Council. It’s often the arts that make newcomers feel at home here. Durant recalls that one of her board members, a professor at the dental school, reflected on the joy he felt to discover that city had a number of barbershop quartets. “If you love it, you’re very happy to find that we have it,” she says. The city is home to more than 20 live music venues in the downtown area – along with a variety of community theaters as well. Local citizens have demonstrated a willingness to come out and support these artists with their time and dollars, says George Claussen, a local concert promoter. Of course, the patron saint of Augusta’s music scene is the legendary James Brown, whose unique style and hit making revolutionized soul music. Like many Southerners she grew up with his music but never realized he was an Augusta native. In fact, he both lived and died in the city. Today, the museum’s most visited exhibit is a retrospective of the life and times of the Godfather of Soul. The museum includes an array of his flashy stage costumes, musical instruments, records, personal items and even a “King of Soul” crown worn by Brown in the 1950s. You can see and hear interviews with the artist and listen to his music. In this city, music fills the air and is part and parcel of both history and everyday life.